The parade of unorthodox buildings bordering the High Line, West Chelsea’s elevated park, will soon have another nonconformist in its midst: a futuristic residence with 39 apartments at 520 West 28th Street, designed by the renowned architect Zaha Hadid. The condominium will be Ms. Hadid’s first residential building in New York City. She is working on the project with Ismael Leyva Architects and is credited as the designer. The 11-story structure measures 135 feet high and can be seen as striking a balance between fractured traditional building forms and Ms. Hadid’s trademark voluptuous curves. After breaking ground last year, 520 West 28th Street is now built to about the fifth floor and should be completed by late 2016 or early 2017, said Gregory Gushee, an executive vice president of the Related Companies, the developer. Sales began this month. Prices for apartments that range in size from 1,691 square feet to 6,618 square feet with two- to five-bedroom layouts are $4.95 million to $50 million. 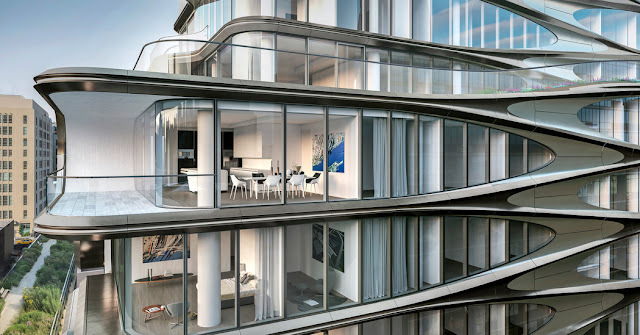 Ms. Hadid, in an email, said her design for 520 West 28th Street was an attempt to evoke the urban dynamic that exists between the streets of Chelsea and the High Line. The building’s sleek, contemporary look extends to the interiors, which were also designed by Ms. Hadid. For instance, she worked with Boffi, the Italian kitchen and bathroom designer, to create curvilinear kitchen islands, Mr. Gushee said. “Basically, it’s sculpture,” he said, and 520 West 28th Street will include a 2,500-square-foot sculpture deck alongside it, with art presented by the Friends of the High Line. The building will have a gallery in its commercial space. The winner of the 2004 Pritzker Architecture Prize, Ms. Hadid has good company along the High Line and nearby, where other Pritzker-winning architects have designed an eclectic collection of buildings, including Jean Nouvel, Frank Gehry, Norman Foster, Shigeru Ban and Renzo Piano. Besides its unusual design, 520 West 28th Street will also have an array of amenities intended to complement apartments priced in the tens of millions, Mr. Gushee said. There will be automated underground parking and a robot-operated storage facility, while apartments will be fully wired to be “smart homes.” Besides the round-the-clock concierge and doorman services typically offered by the Related Companies, there will be a “luxury attaché” to handle everything from booking a restaurant to booking a helicopter, Mr. Gushee said. The building will have a 75-foot pool and a gym, along with a spa suite featuring a spa pool, cold plunge pool, waterfall shower, sauna, steam room, chaise longues and massage treatment beds. An entertainment lounge off the double-height sculptural lobby will have an outdoor terrace next to the High Line. The building will also have a private 12-seat IMAX screening room. Kitchens will have appliances by Gaggenau, and the bathrooms will have electrochromic glass, which frosts over at the touch of a button for privacy.